A new database suggests say there has been a dramatic under-reporting of the live, illegal trade in great apes. 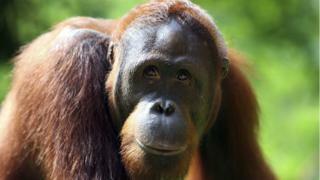 Around 1,800 orangutans, chimpanzees and gorillas were seized in 23 different countries since 2005, the figures show. Since 90% of the cases were within national borders they didn't appear in major data records, which only contain international seizures. The new database has been published at the Cites meeting here in Johannesburg. Comprehensive data on the illicit trade in great apes is rare. The Convention on International Trade in Endangered Species (Cites) only keeps records of international seizures, which experts in the field have long believed was giving a misleading impression. The new Apes Seizures Database paints a more detailed picture, compiling figures for any seizure of a great ape in an unlawful situation dating back to 2005. "It's definitely a staggering number, it's larger than we expected," said Doug Cress from the Great Ape Survival Partnership, who have put together the new database. "We're finding that it's really averaging about two seizures a week around the world. That may seem small but the usual ratio for a chimpanzee is that to get one alive you've had to kill five or 10, for gorillas it's like four to one. "That extrapolates quickly to a lot of dead in the wild." Orang-utans were by far the most commonly captured animals, accounting for 67% of seizures by the authorities. It's believed that habitat destruction in Borneo and Sumatra has seen large numbers flushed out of the forests. The conversion of their natural homes into palm oil plantations or for pulp and paper has made the orangutans easy prey for those who want to trade them illegally. Chimpanzees represented about a quarter of all seizures while gorillas represented six percent and bonobos around 3%. "This is a live trade, mostly infants that have to be moved quickly," said Doug Cress. "They are trafficked on fast routes - that usually means hand luggage, the overhead bin in your airplane." While Indonesia and Malaysia are high on the list of countries with seizures thanks to the orangutans, West Africa also emerges as a hub, specifically countries such as Sierra Leone, Guinea and Cameroon. What's feeding the trade is money - a chimpanzee in Asia can sell for between $25-30,000. A gorilla can command up to $45,000. As well as the animal welfare worries, and the impact on wild populations, there are also concerns about the potential to spread disease. HIV is believed to have originated in apes before being transmitted to humans. Doug Cress believes that the new method of collecting and monitoring the data will help the fight against the live trafficking of these animals. "Most databases have up to three years for countries to file information, but by then the trail is cold. "We are talking about live time with this new database, when we see trends we will inform Interpol and Cites immediately." The Apes Seizures Database has been built by the GRASP Partnership, in conjunction with the UN Environment's World Conservation Monitoring Centre.